Have you ever gotten onto a color kick that you just can’t seem to quit or do you have a favorite color to wear that you keep buying again and again? Well for me lately I’ve been obsessed with all things olive green. From shoes, to tops, pants and bags, I’ve not been able to stop myself! It’s a great color right now as we transition from winter to spring. It’s feeling lighter and brighter, I’m sure you are wanting to shed all the heavy and dark winter colors in favor of lighter and brighter colors. Because I’m obsessed and because it is a great color for this time of year, I’ve rounded up some of my current favorites in the hopes that you will get inspired too! I love tote bags. I’ve talked about them many times before and this one is the perfect casual bag. I love my leather stripe one from last fall but wanted a canvas one that felt more casual. 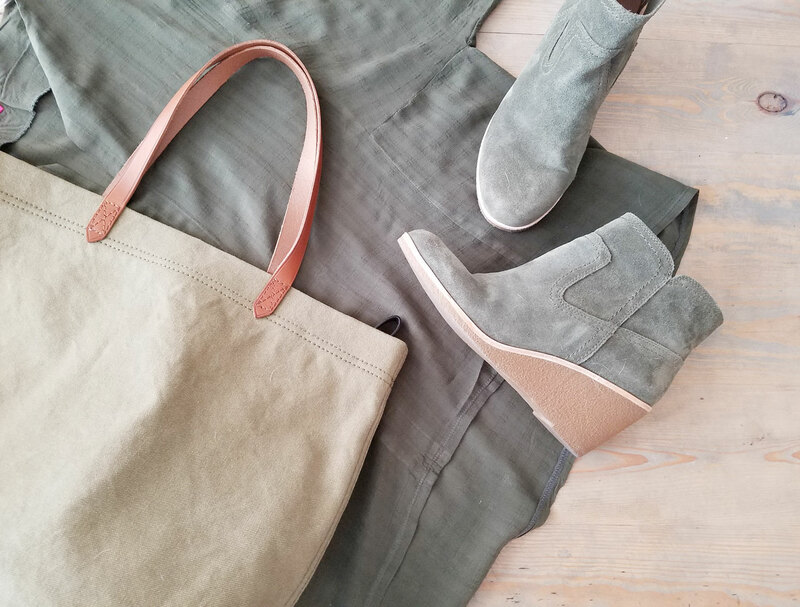 When I found the Madewell tote in canvas and in olive green I knew I needed to add it to my wish list. It’s one of the few early spring pieces I have added to my wardrobe. I found these booties on sale after the holidays but didn’t buy them right away. When Stewie chewed a pair of my boots destroyed them, I decided to get these instead of a pair of tall boots. I’m so glad I got these because they are beautiful and extremely comfortable. Having bad knees I wasn’t sure I’d like having a heel even though wedges tend to be more comfortable. These don’t even feel like a heel and they are almost as comfortable as my sneakers! The color is so pretty too and they look great with so many things. A great alternative to black or brown. One of my more recent purchases, I cannot wait for the weather to warm up enough to wear it. I sized up to try to add length because it is shorter in the torso than I’d like. It looks super cute layered over a tank top with jeans. I love that it’s flowy without feeling bulky and it’s like a spring version of my beloved poncho! I have a couple pair of olive cargo skinny pants from J Crew Factory and Banana Republic from a couple years ago that are very similar to these. I didn’t buy these so I can’t speak for them specifically but the style is pretty close to the ones I have. They are just as versatile as a pair of jeans so though I don’t need yet another pair of these pants, I really loved the color of these so I included them in this roundup. If you don’t have a pair of pants like this, I highly recommend adding them to your wardrobe for a fun alternative to jeans. I was so glad to see Old Navy kept this jacket for another season. I bought mine last year as a replacement to a similar jacket from old navy from nearly 10 years ago. I love the updated shape of this version and once again, the color and style makes it one of the most versatile pieces in my spring wardrobe! I’ve been itching to pull mine out! 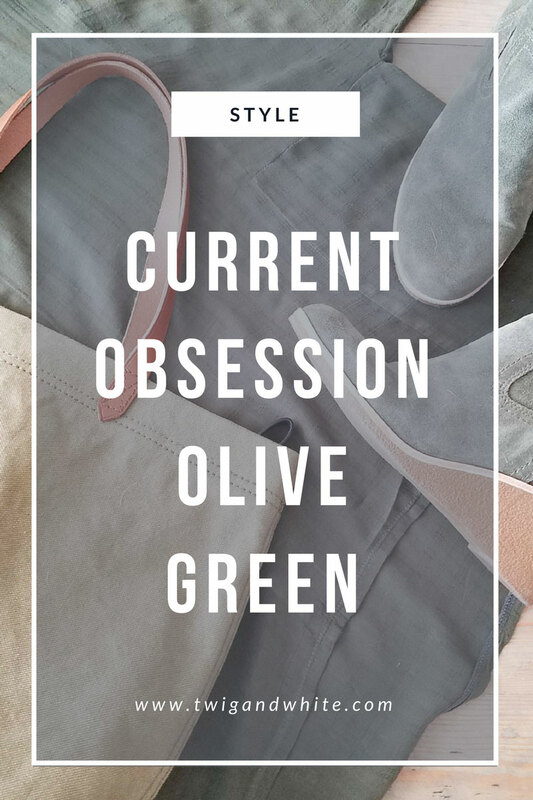 Olive is a great color for early spring and while it is a current obsession of mine, I know it will be a great color in your wardrobe as well. Do you have a favorite from the round up or are you on a color kick right now? If so, leave a comment below and tell me about it.